For my 26th birthday just over a week ago, I decided to spend the weekend in Cape Town for sun, sea, food, friends and cocktails, oh and of course the Cape Town International Jazz festival which was especially co-ordinated to coincide with my crown birthday celebrations (Thanks ESPAfrika). Anyway, I flew the green low cost airline with the mispronounced name both ways and this is who my letter is directed to. We all know that these supposed ‘open letters’ have a format – preamble, praise, complaint, diplomatic conclusion or something along those lines. So here goes…. After much debating, I elected you as my preferred mode of transport from Johannesburg to Cape Town for an epic weekend away to celebrate my born day weekend towards the end of March 2011. You won my patronage by having the lowest cost, the fact that I could depart and land at Lanseria airport, which is thankfully only 20minutes from my house, and finally because I can use my Discovery Vitality for a small but significant discount. You also surprised me by giving me R50 moola when I signed up to be a Jetsetter, which went towards the total discount for my return trip. For all that, I thank you. You usually have friendly staff members who always have a smile on their faces and this has not changed, at least in my experience with your airline. Your quirky on air exercises are most entertaining, even if a little cheesy. I especially love the cabin crew’s script that takes a funny jab at other airlines and goes something like “remember, mango’s are good, but you must have your greens. We don’t want to see you one time; we want to see you all the time”. Finally, as I mentioned earlier, flying to and from Lanseria is such a breeze because it’s close by. So thanks for making life a little easier and lighter. I am not at all a fussy or impatient passenger. I’m a ‘go with the flow’ kind of traveler; which means that very little bothers me, I don’t get irritated easily with the inconveniences of the factors of travel – i see it all as an experience and as long as I get to where I’m going, I’m okay. So the fact that I am now writing a letter of complaint means you messed up in a big way in my world and I need to address it. On Monday 28 March I was booked on the 17:30 flight from Cape Town to Johannesburg on flight MN452 due to arrive at Lanseria Airport at 19:25. I arrived early and checked in using the self check in machine which took all of 30 seconds. While I was purchasing sweet chewy goodies from the confectionary stand I heard over the PA system that the boarding gates had changed, and this change only happened at about 17:10, so in a panicked state i ran to the new boarding gate. My boarding pass thingamabob advised that boarding gates would close at 17:20 so it was a little surprising that we had not started boarding at 17:19. There was no information stating any delays or advising us of what was actually halting the process. Finally around 17:25 I saw people standing up from their seats and lining up to have their tickets checked and ushered to the shuttle buses to take us to the green flying machine. At this point, there was still no advisory stating that we were running late even though we all knew there was a glitch. The doors finally closed at 19:45 and the cabin crew welcomed us onto the flight – again, no word on the delay. I think we taxied 5 minutes later and the pilot made some mention that we had been delayed and that we were on our way to Johannesburg. Happy days, but why did it take so long for anyone to say anything? It’s not as though we would have had a riot in the airport because the flight is a few minutes late – but it does help us let the people picking us up on the other side know what’s going on – remember there is no Gautrain at Lanseria! 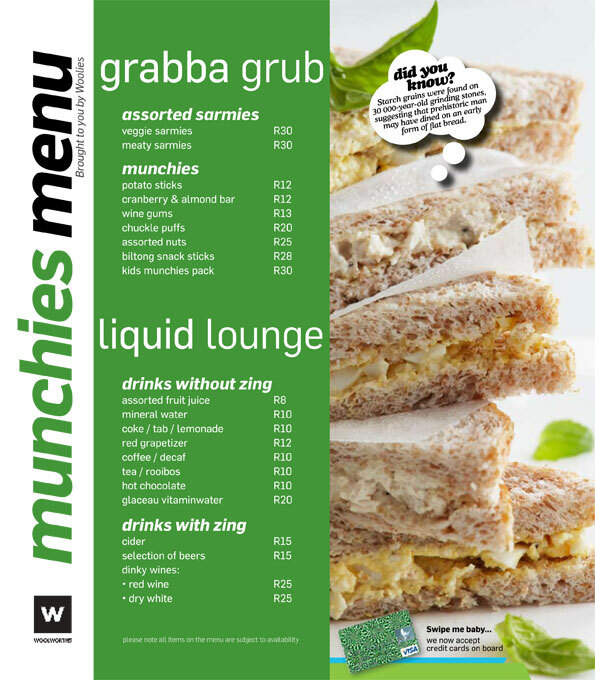 So as I paged through the hilarious, informative and entertaining copy of your in-flight magazine I noted some heavenly words that had me salivating – “Brought to you by Woolies”. I sent a silent thank you to the heavens and waited patiently for the food cart to come by, ready to have a delicious sarmie from Woolies that I was sure would give my tummy a comforting high five. The cart came by; I parted with my ZA Rands, pulled out my tray table and prepared my mouth for the yumminess coming its way. My first bite enticed a little tear to roll my cheek and I’m pretty sure my tastebuds wanted to have the salty liquid rolling down my face instead of the assault that was happening by way of the Woolies beef and mustard sarmie. Oh my poor heart. Well no, my poor mouth. Well no, my tummy. The travesty that was the soggy mess I bought. What a great idea it must have been to offer passengers “quality” food from the superior food supplier but my goodness let’s not forget that whatever crack Woolies pits in their food to keep us happy and loyal customers – it cannot by no means ignore the “fresh” requirement? I don’t even know how old that sammich was but a big bright non-woolies sticker on the packaging claimed it would be great until 30 March. I’m not too sure about that. The bread didn’t have that bouncy softness, the lettuce didn’t even pretend to crunch, the mustard had not only snuggled itself with the bread but it was holding on as if its life depended on it – the mustard might also have been crying because it made the bread its handkerchief. Let’s not even talk about the beef. Basically it looked at me and said “I’m dead, you happy now?” Maybe I shouldn’t have broken the Meat-Free Monday rule. It’s my own fault. A great thing from that though is that the gentleman sitting at the window offered me his window seat to make me feel better. Disappointing and heartbreaking. If this Kulula and Woolies marriage is going to last the food better be fresh, otherwise the reasons for divorce will be stated as “defamation of character”. Imagine if that was my first experience of Woolies food? I’d never step into Woolworths Food ever. As comedic relief at the end of the flight, I got to watch the stairs car thingy get stuck on its way to the front of the airplane and the little guy driving the machine struggle for a few minutes until another staircase machine from nearby zoomed to the rescue. That was funny. So Kulula, I don’t have a flowery conclusion to this letter so I’m just going to say – get your act together because as your name suggests, it should be “easy” to fly with you.